We’re happy to welcome back Isabel, she has stopped by in the past to share her favorite Oliver + S pattern, the Art Museum Vest. Today she’s going to talk about her favorite Liesl + Co. pattern. Take it away Isabel. Hello! I’m Isabel from the blog La vie en DIY where I share my sewing projects. I’m so excited to be here today to share my favorite Liesl + Co. pattern, the Everyday Skirt. I have never been a “skirts girl” because I never found a skirt in a clothes shop that fit well enough to make my figure feminine and still feel comfortable. 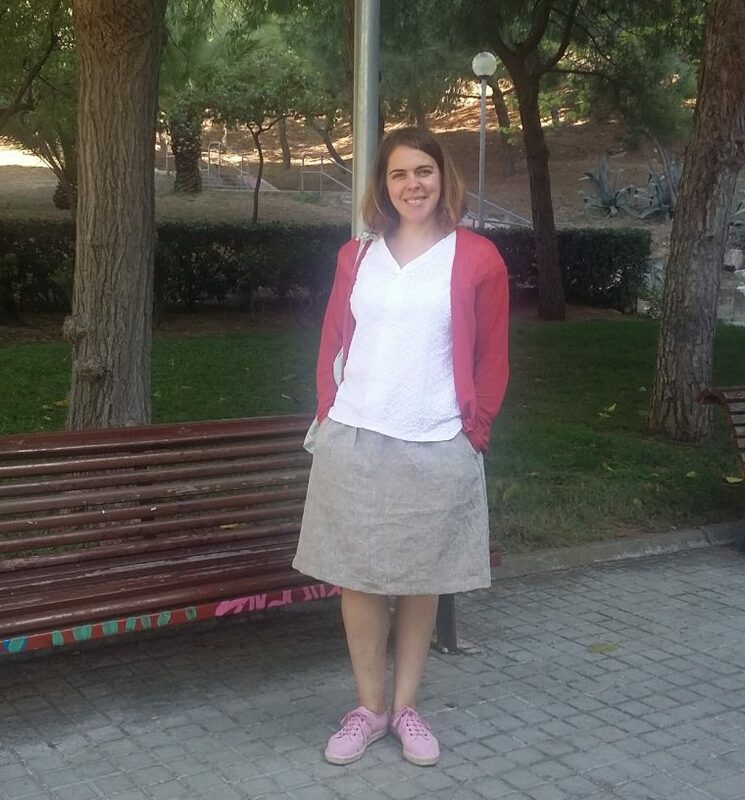 Years later I learnt sewing and one day I discovered the skirt: the Everyday Skirt. This was my first Everyday Skirt. 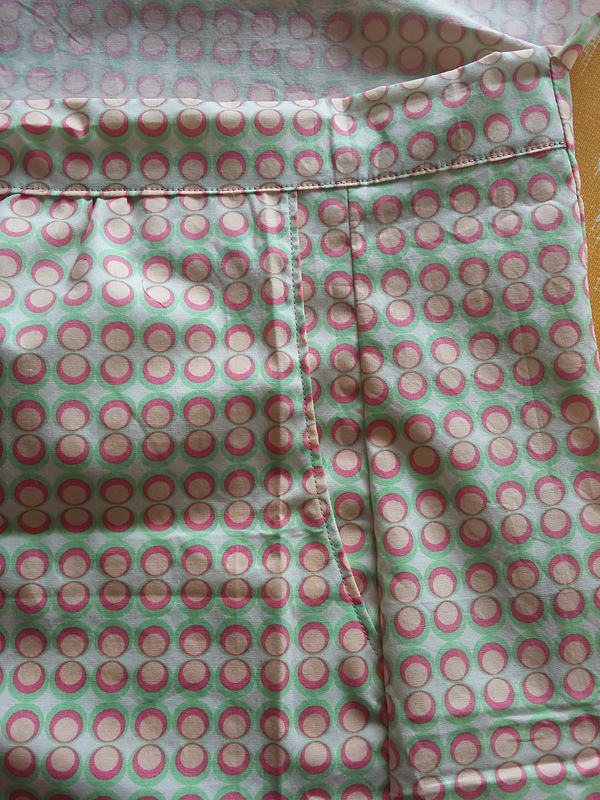 I used a cotton fabric I bought two years ago while holidaying in Alicante (Spain) with the idea of sewing a dress, but how beautiful it looks on this skirt!? And I assure you, it is so comfortable! Sewing this pattern is bliss. Seam allowances in Liesl + Co. patterns are included (something I particularly like about sewing patterns, it makes sewing more accurate) and the instructions are very clear. Every step is explained with words and with pictures. Anyway, building this skirt is easy. I read all of the instructions for my first skirt, for the second I just checked a couple of steps, and for the third I did it by memory. The fact that the Everyday Skirt pattern does not have buttons, buttonholes, or zippers makes the pattern ideal for beginners and for impatient sewists. The second skirt was a linen version and slightly longer. I bought the fabric specially for it, and I like how it came out. Only one thing I would like to mention about this pattern, the sizes are quite generous so if normally I sew an L size, for this one sewing an M is enough. 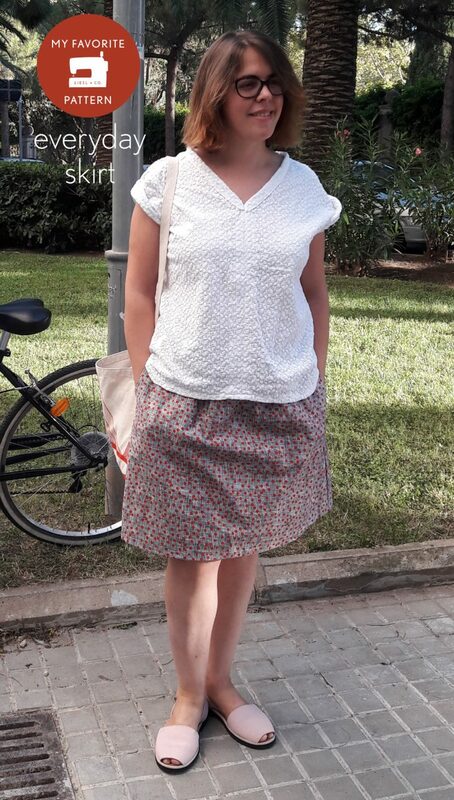 For example, my first Everyday skirt is an L and you can notice more folds in the back than the third one that is a M. In any case, the waist is finished with elastic on the back which is ideal to wear it comfortably no matter if you walk or you sit. You can see the back in my third skirt! I can’t resist showing you how beautiful is the making-off of this skirt, look at the pocket! In a period of three months I’ve sewn three! and I only stopped because the autumn is coming fast. But maybe a shorter version using a dark wool would be nice, what do you think? Really beautiful! Love the fabrics, and lovely job on the sewing. Very inspiring! These are so nice! Thanks. Also wondering if you made the v neck white shirt. It is perfect with the skirts!